Sponge Cords Manufacturer, Sponge Cords Manufacturer in Pune. sponge sealing cords are cords manufactured from lightweight (microporous) rubber. The diameter of the sponge sealing cord is expressed by the diameter of the cord in mm. Extruded sealing cords are where necessary soft, pliable and elastic, and have a relatively low weight even with large diameters. Sponge sealing cords are designed for operating temperatures from -30 °C up to +80 °C. 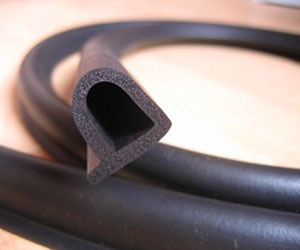 sealing cords are very reliable in applications where it is not possible to use sealing cords made of compact rubber. The profiles on offer are supplied in original packages.